Brother Dori, a Korean fellow initiate who attended the Seoul lecture recalled, "May 8, 1993 was a special day for the Korean people. The Supreme Master Ching Hai from the Himalayas delivered a grand lecture in Korea. Tens of thousands of people learned about the lecture from posters and photos posted in cities around Korea. They flocked to the lecture venue to hear Master's teachings. 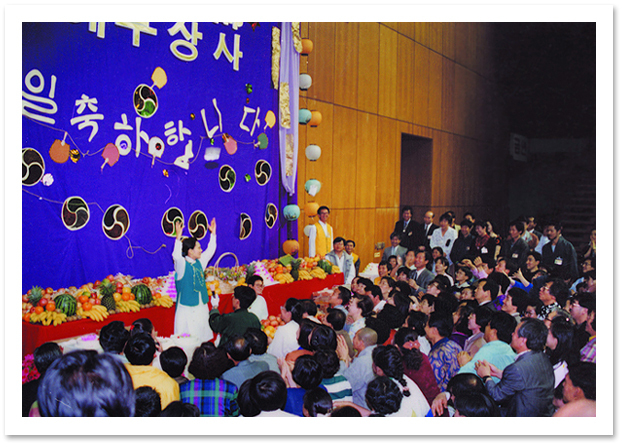 Many lectures on spiritual and religious themes had been held in Korea before. However, this was the very first time that such a big lecture had encompassed all religions and ideologies. On that day, Master spoke of things new to us in a natural but unique way. Although the Bible and the Buddhist scriptures are difficult for the average person to understand, Master presented the Truth in a simple way that made it easily comprehensible. She spoke naturally and humorously. The attendees enjoyed the lively lecture in a cozy atmosphere. Every word, every sentence spoken by Master was charged with loving energy that touched the depths of our hearts." The lecture in Pusan left the Korean people even more impressed. The lecture site was an Olympic stadium that could accommodate thirty to forty thousand people. Our work team, fearful that even the millions of leaflets, sample booklets and posters would be inadequate to attract a full house, posted hundreds of huge banners around Pusan three days before the lecture. As in many other countries, Korea has strict regulations on the placement of posters and banners, but the police officers were moved by the fellow initiates' perseverance and hard work, especially when these advertisements were cleared away overnight immediately following the lecture. The citizens were amazed by the discipline of our group.